These days, of course, this wonderful non-album b-side — the only one that Led Zeppelin ever released — can easily be found on the expanded version of Coda, or the box set, or Spotify or YouTube or whatever. But it wasn’t always the case: for the longest time, “Hey, Hey, What Can I Do” was more a legend that anything. 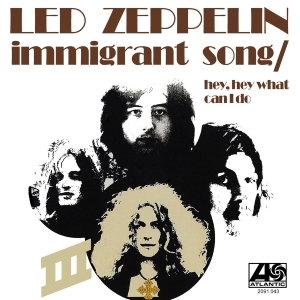 Sure, the “Immigrant Song” single sold pretty damn well, but for whatever reason, its b-side was for the longest time one of those things that I read about in the record store listings in the back of magazines or in articles about rare tracks. So, like “Heaven and Hell” by The Who or Dylan’s live 1966 version of “Just Like Tom Thumb’s Blues,” actually owning “Hey Hey What Can I Do” was something that eluded me longer that I wanted it to.